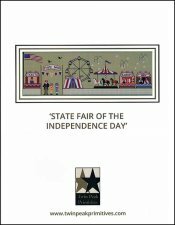 State Fair Of The Independence Day [G5584] - $16.00 : Yarn Tree, Your wholesale source for cross stitch supplies. Cross stitch pattern by Twin Peak Primitives. Red, white & blue, fireworks, rides & candy...it's "State Fair Of The Independence Day." Three people stand at the entrance, welcoming you into the fair. Don't forget to buy your tickets for the Ferris wheel, carousel & circus! Cotton candy, taffy, lollipops....which candy are you going to choose? Get ready to celebrate at the state fair! Stitch count is 426W x 142H.